Did Fleury mock Kuznetsov and his bird celebration after win over Washington? Tuesday night, the Golden Knights hosted the Capitals for their second meeting of the season and first in Vegas since watching Washington lift the Stanley Cup in "Sin City." The Golden Knights haven't been as good this season as they were last season, but it looks like they're starting to hit their stride and they continued their winning ways as of late with a 5-3 victory over the Capitals. Marc-Andre Fleury was solid, stopping 23 of 26 shots against him and after the game, he celebrated in a noteworthy way (for Caps fans at least). Was Fleury mocking Evgeny Kuznetsov by doing his celebration? 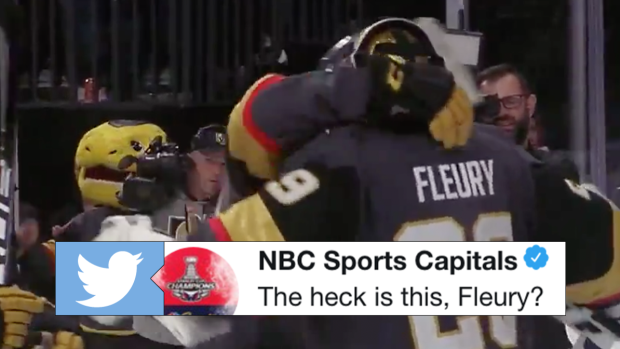 It seems that way considering we haven't seen Fleury ever do that and he did after beating the Capitals (he also did it with former Cap Nate Schmidt). Once Washington fans saw the celebration, they weren't very impressed to say the least. Trashy as always! Pittsburgh mentality! Nice win, MAF. Tell me, do you get a ring for that? Kuznetsov, like Fleury, has a sense of humour, so we'd like to think he'd laugh about the celebration unlike some of the fans who were a little upset about it. Fleury and company have every reason to celebrate right now, too, as they've won 6 of their last 7 games.